Quietly opulent, this curio cabinet brings polished style to any home. The piece features two glass shelves behind a glass door for display, with luxurious accents of emperador stone. Light Elm eco veneers lend a more natural feel to the piece, the unsymmetrical wood glass doors and mix of materials posing an intriguing display of balance. 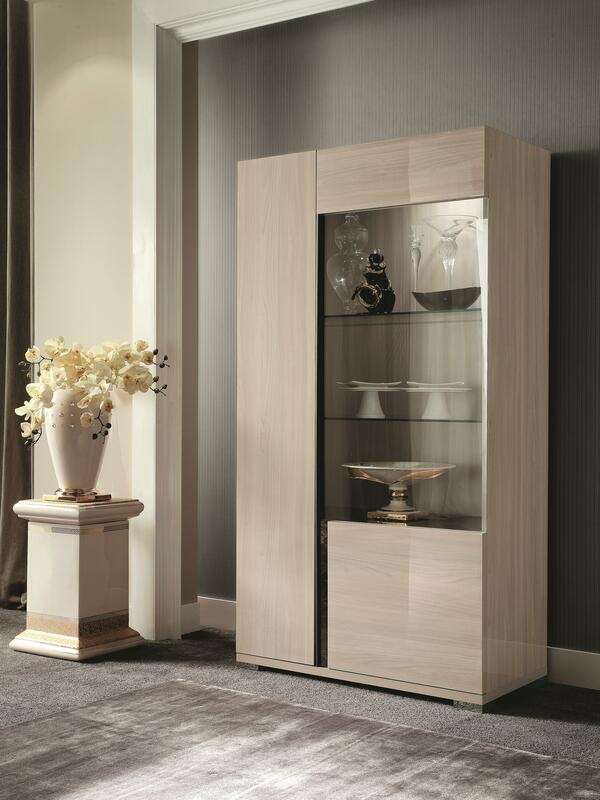 Chic and luxurious with marbled accents and a high gloss finish, this curio cabinet offers stunning modern style. The Teodora Curio Cabinet by Alf Italia at HomeWorld Furniture in the Hawaii, Oahu, Hilo, Kona, Maui area. Product availability may vary. Contact us for the most current availability on this product. The Teodora collection is a great option if you are looking for Contemporary furniture in the Hawaii, Oahu, Hilo, Kona, Maui area. Browse other items in the Teodora collection from HomeWorld Furniture in the Hawaii, Oahu, Hilo, Kona, Maui area.